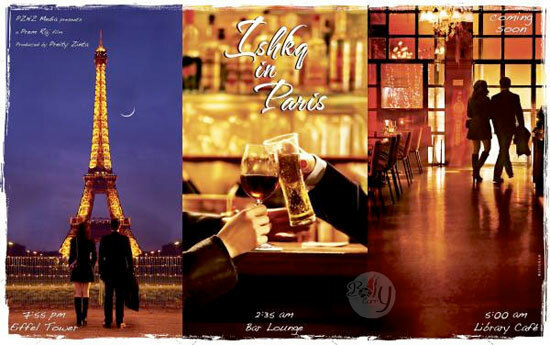 Romantic dinners and long walks hand in hand - romance is all set to fill the air in Preity Zinta's debut production Ishkq in Paris. The movie is slated to release on September 21st and BollyCurry brings to you the first look of this much awaited release. The much talked about film introduces the new actress Isabella Adjani, and stars the well-known Salman Khan, with first-time producer Preity Zinta being at the helm and Prem Soni donning the directorial hat! The poster shows three different romantic settings, and the implication behind it is that the film will show three different ways of showing love at three different hours. The film signifies the fact that love is timeless. BollyCurry wishes Preity all the best on her first venture into producing, and hopes the film will reach new heights of success. Editors: Anhdara & Gunia M.